Ships from and sold by TheProductsHub. The Shaolin Grandmasters' Text is a one-of-a-kind volume discussing the history, philosophy and Gung Fu of Shaolin Ch'an, one of the most misunderstood schools of Ch'an Buddhism. In this revised edition, the Order of Shaolin Ch'an have updated information on their martial and Buddhist legacies in an effort to further preserve the Order's heritage. Beginning in 1901, the most senior priests of the Shaolin Order fled a war-ravaged China. Over a period of several years they gathered in New York City's Chinatown. For the last 100 years, the Order of Shaolin Ch'an has worked quietly to preserve the traditions, philosophy, and arts of the Order in the United States. Since the 70's, when Shaolin and its martial arts increasingly became a focal point of popular culture, misinformation and disinformation have anchored it in a growing notoriety. In contrast, this volume strives to accurately share what is spiritually meaningful and martially significant about Shaolin. The living authors are Shaolin monks who wish to remain anonymous, but who put the book together largely from written records and orally transmitted teachings from three Shaolin priests, all of whom passed away in the 1970's. They wereLi En Huo, Hua Ling P'o, andBen Ch'i Lo. 5.0 out of 5 starsA "MUST OWN" book for practitioners of Chinese Martial Arts. This book is a "MUST OWN" for anyone practicing Chinese Martial Arts. The book has everything from sweeping overviews of traditional Chinese martial arts to individual instructions for particular exercises. DON'T LET THE NEGATIVE REVIEWS FOOL YOU! The authors chose to remain anonymous, and mention this in the book. In addition to the plethora of coverage of styles, philosophy and historical context, the book contains a glossary, appendix, and a sizable footnotes collection. If you read other sources of information regarding the martial arts, you will see clearly the VAST array of knowledge presented in this book. It is expansive, and it falls in line with what other prolific authors (Dr. Yang, et al.) write about Chinese martial arts and enlightenment. Thoughtful and filled with insight, the book uses a simple language to explain many Buddhist and martial arts concepts to the English-reading audience to which it appeals. This is my third purchase of this book, as the first was stolen, and the second I gave away as a gift. The book contains much understanding of the Buddhist approach to Ch'an (Zen) in the martial arts. 5-stars. This is a goldmine! I've been studying Shaolin-based gung-fu for a number of years. My teacher's teacher fled China during the time when the "old wisdom" was being actively snuffed out. This book not only gives an intriguing account of Shaolin history, but also a crash course on Buddhist and Taoist philosophy and an insight into forms and styles. As this was written by many different people, much of the writing is quite stellar, however there are a few sections that get bogged down by, in my opinion, slightly skewed opinions. As with anything (and this book would agree), it's important to observe and evaluate on your own accord. That being said, I thoroughly enjoyed it, and I hope you can find some useful information in there too. Forty years ago I was fortunate to begin studying with a Shaolin Master whose teachers had come to America from China during one of the purges. These teachers were from both Southern and Northern temples and taught a blend of styles from those temples. The lessons, philosophy and teachings that were instilled in me have had a life long impact. I was hesitant to buy this book because of a number of negative reviews I read on thisr forum. It was not until I did purchase and read this book did I realize all the negative comments had been made in light of comparing Shaolin to what one experiences today in martial arts gyms. Or by comparing the book to what is coming out of China's Communist state run newly created Shaolin Temples. The Chinese government has "restored" several of the temples and now have "warrior monks" traveling around the world performing for money. They even have branch temples here in America. The so called monks are nothing more than actors who perform an acrobat art called Wu Shu, which was invented by the Communist government in the 1950's. When I read this book it was as if I had stepped back in time and was listening to my teacher. This book portrays the essence of Shaolin philosophy as it has been preserved by its monks for centuries. I did find some minor differences, but that is to be expected. If you are truly interested in what genuine Shaolin is about, regarding its philosophy as well as the styles of Wugong (Kung Fu) that was taught then pick up this book and read it carefully. I am happy that somebody is preserving the true history, art and philosophy of Shaolin. My perspective is based on being a student of Ch'an Buddhism for decades, and of Wing Tzun kung-fu (EBMAS - local training with a Si-Hing) for months so far. And so for me this was the perfect book. I love China history and culture. I have friends from China, and am aware of the political realities (and changes, with modest recent improvement) there now. This book is written by Shaolin Ch'an exiles from China - due to persecution by Chinese governments, including the PRC and previous governments. And so there is some controversy as a result. 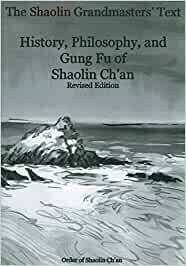 That is context - but the important point of the book is the history, philosophy and culture of Shaolin Ch'an, as well as a summary review of its fighting arts (gung fu). I find it to be excellent and true in every way. As a newer student of Wing Tzun kung-fu in a lay school (EBMAS), I especially enjoyed the greater context and history provided about Wing Tzun as a style developed by Shaolin. As a Ch'an Buddhist, I enjoyed learning about the Ch'an philosophy and practices that went along with Wing Tzun as developed by Shaolin. This is the best book, linking these two important subjects for me. Another interesting aspect is its report on the important role of women in Shaolin Ch'an Buddhism and Gung Fu. In fact, Wing Tzun is a Shaolin martial art style developed by a female Shaolin monk. It is well written, and includes references to modern American culture, as well as other published works. All of this enhances understanding. Highly recommended. it is apparent that Order of Shaolin Chan has an agenda to promote themselves. Never-the-less, I enjoyed this book.